Celebrating 25 Years: 1990 to 2015 – Americans with Disabilities Act. 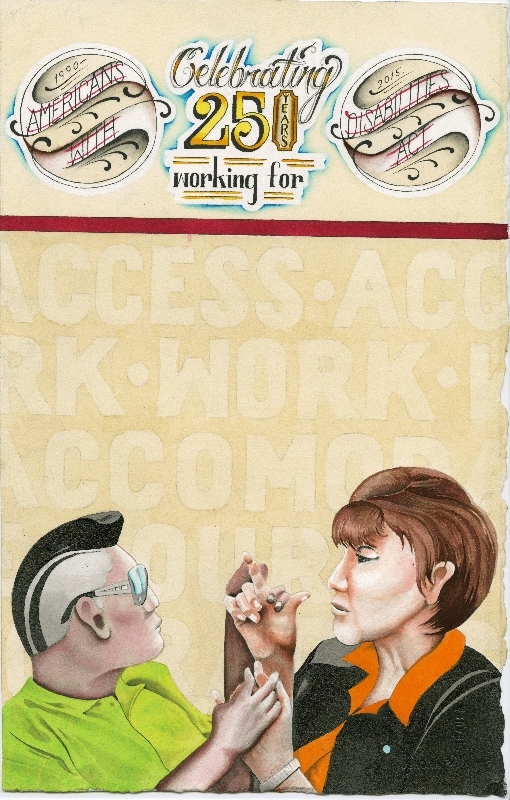 Working for: “Access”, “Work”, “Accommodation”, and “Courage”. A young man works with a DeafBlind interpreter. The civil rights of people with disabilities often go unspoken and are overshadowed by discussions on race and sexuality. There is much work to be done in order to bring the disability conversation into the mainstream where it belongs. These pieces were created to commemorate the 25th Anniversary of the passing of the Americans with Disabilities Act, and also to bring awareness to the discrimination that continue to confront people with disabilities. The civil rights of people with disabilities often go unspoken and is overshadowed by discussions on race and sexuality. There is much work to be done in order to bring the disability conversation into the mainstream where it belongs. Disabilities touch us all in one form or another, whether it be physical or mental disease or injury, we all have someone close to us whose quality of life depends on the kinds of things that the Americans with Disabilities Act has provided. Job opportunities and access to buildings and services have improved in the 25 years since the Act was passed, but public awareness has remained nearly the same. I hope to spark interest and encourage increased disability advocacy with these pieces.